Ananthi Sasitharan TNA member of the Northern Provincial Council was in for a surprise when she arrived at the Mullaitivu Magistrates courts on 21st July 2014 for the continuation of the case filed by her. She never expected hundreds of Tamils to brave the scorching heat to arrive demanding to know what she and her husband LTTE’s Elilan had done to their children. The situation became so intense that Ananthi Sasitharan had to eventually seek solace of the security forces she and the TNA want to throw out of the North. Families of Missing Tamil Children kidnapped by LTTE braved the heat to arrive at Mullaitivu courts waiting to ask TNA’s Ananthi Sasitharan where their children were! These poor Tamil families mostly from the Wanni were victims of LTTE. It was from these that the LTTE plucked their cadres especially the children. Jaffna Tamils should open their eyes to the crimes the LTTE & TNA committed. They didn’t have printed sophisticated posters that other NGO funded demonstrations help organized. These were ordinary people now brave enough to come out and demand questions from the TNA-LTTE about the whereabouts of their children. 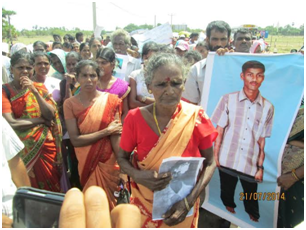 These Tamil families deserve answers. 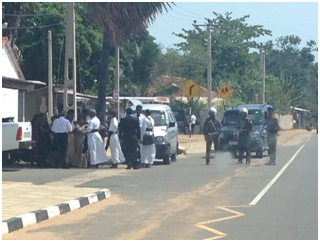 TNA’s Ananthi Sasitharan arrives at the Mullaitivu courts accompanied by Church priests in a hiace van. She did not expect to see scores of Tamils arriving on foot to demand from her what she had done to their children. She did not expect that as a TNA member she would be subject to questioning. Her realization of their anger was such that she had to seek solace from the very authorities she and the TNA had been demeaning across all mediums globally and locally. It was these authorities that helped accompany her to the van and to safety. A word of thank you to them in the least – not at all! 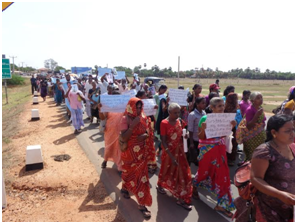 Over 350 Tamil families arrived on foot to demand answers from Ananthi Sasitharan. On 21st July Ananthi found herself minus the TNA and only accompanied by Christian priests. Their chants were clear. The families wanted to know where their children were. No NGOs, no foreign envoys, no Navi Pillai, no UN questioned Ananthi on what the LTTE did to their kidnapped children? 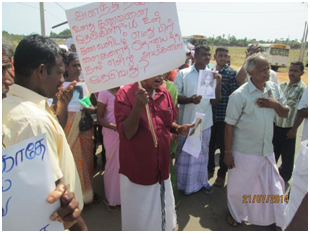 These families had to take solace in handing a handwritten petition to Coordinating Assistant to the President in Mullaitivu District Mr. S. Kanagaratnam. 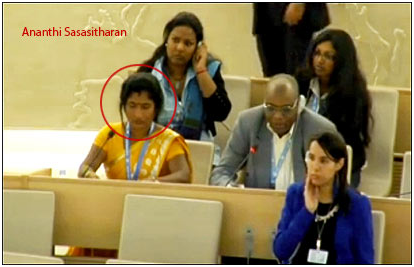 How could the West have allowed Ananthi Sasitharan airtime of NGOs representing other nations to stand before the UN and talk about her ‘missing’ LTTE husband knowing that this ‘missing’ husband was responsible for taking scores of children during the last stages of the war from grieving parents simply because the LTTE were running out of people to fight on their behalf? Is this the face of the ‘innocent’ that the American envoy and Stephen J Rapp was happy to meet and exchange pleasantries? How is it that they had no time to meet the families of children kidnapped by the LTTE, families who do not know how to even mourn not knowing whether their children are alive or dead? Virtually none of the reports compiled since the defeat of the LTTE has gone to describe or even accuse the LTTE-TNA links and explored in what ways these supposed representatives of the people had played an indirect role in recruiting Tamils by force as cadres. 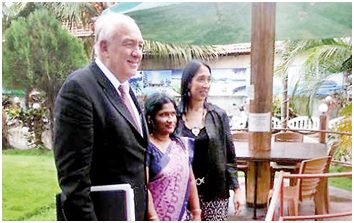 While there are scores of NGOs, foreign envoys and local stooges to give handkerchiefs for Ananthi Sasitharan’s crocodile tears weeping for her ‘missing’ terrorist husband, none of these entities bothered to even write a single line on the missing children of the over 300 families that braved the hot sun on foot to arrive to voice their concerns. Not even the supposedly unbiased media in particular the English media in Sri Lanka have given much emphasis to the plight of the Tamil civilians of the Vanni from whom the LTTE had been plucking out people as cadres for decades. It is something that the Jaffna Tamils are totally unaware of and possibly do not care about because the Vanni Tamils are of low caste. Nevertheless, the trend is looking not too good for the TNA. The silent majority of Tamils who had been confined to the Wanni and kept separated from the rest of the world are now realizing the diabolical side of both the LTTE and TNA. The link is very visible and one that is showing cracks too. With India clear on its stand and against Eelam it is no surprise that the TNA is looking to wind up and emerge under a new name. It is a pity that the human rights mechanism has purposely kept out of their records examples of atrocities committed by the LTTE and their link party the TNA and in so doing allowed them to speak before the UN with human rights representatives taking the side of the very people that were responsible for kidnapping children. We need not elaborate further on the hypocrisies that take place within the halls of the UNHRC where justice is one-side and where officials are paid to be one-sided and assured plum positions for their role. It is left to ordinary Tamils themselves to brave the heat and arrive by foot to make their sorrow known and when media too choose to shun that coverage it goes to show how fair and one-sided even the media is. The media chose not to give coverage for the sorrow of Tamil families in June and they are doing the same once again – a brief mention they think suffices to officially place they have covered the story. Similarly, scores of local stooges dished out millions for campaigns and propaganda have not spent a penny to highlight the stories of these missing children or even bothered to visit their homes to cover their versions and thus none of the foreign missions, foreign statements ever carry the other version. The case has been postponed to 25th September 2014. IDEAL SITUATION TO SEND THE TNA VOTES TO BITS. GOSL MUST ACT FAST. This is COMPLETELY FALSE unfortunately. Tamils will NEVER leave TNA, ITAK and the like because RACIST POLITICS attarcts Tamils. 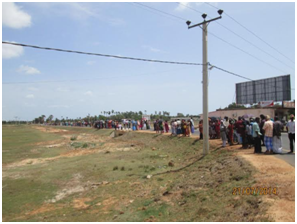 MOST of these Tamils were promised STATE LAND in return. That is why they protest. Their protests are NOT dramatic as TNA organized protests where Tamil women howl, roll over the road, scream, jump up and down and make a joke of themselves. A VERY DECENT protest. The bitter truth is Tamils are even more attracted to TNA today than in 2010.